The KIJHL had it’s genesis in the summer of 1969 (Bryan Adams aside) when a group of interested hockey people met and formed the West Kootenay Junior Hockey League. It started with 5 teams: Castlegar, Trail, Rossland, Grand Forks, and Nelson. The “international” aspect, came into effect when Spokane joined the League in 1972. Hence, the Kootenay International Junior Hockey League was formed. The Beaver Valley Nitehawks joined the KIJHL in the 1981-82 season and have continued ever since. The early,formative years were difficult in terms of accessing local players because there were KIJHL teams in Rossland and Trail. The Nitehawks strove to be the “best they could be” primarily with Beaver Valley kids and in so doing, improved the quality of hockey in the Valley. Local players and “imports,” over the years, have brought their effort and inspiration to make BV one of the most successful teams in the KIJHL. 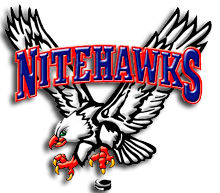 In fact, the Nitehawks have the most league championships (7) of all active teams in the KIJHL. The Beaver Valley Nitehawks are a very prestigious “family” not just for, or because of, the players who went on to become famous (and of whom we are very proud ), but for each and every young man who wore the blue and orange. The Beaver Valley is honored to have nurtured so many fine young men over the last 35 years and we are hopeful this team will continue for many years to come. We would be remiss if we did not mention the hundreds of volunteers who coached, managed, trained, worked on the executive, billeted, ran the clock, did security, sold tickets, etc., etc. These people are the very backbone of this “special family” and were it not for them the Nitehawks would not have existed. Thank you for your hard work. The following is an attempt to list every Nitehawk player from 1981 to present day. This is difficult because some young men only played a few games and may not qualify as alumni. We decided to list players who have played at least 20 games in any season as “alumni.” Also, statistics were not previously tracked as they are today and we profusely apologize to any players we have missed. It is our hope that this list will be transcribed via ‘the social media” and reach every Nitehawk Alumni in the future. Please contact this website with any corrections. Players and team officials are listed by year and team, and also alphabetically.